Liens are instruments, recorded with the land records for the locality where the relevant real property is situated, that document the agreement between the owner/customer and the contractor. They identify the primary parties and generally include a description of the work requested, a tentative schedule, and an information about charges and payments. Contractors and other authorized parties (claimants) use construction liens to protect their interests while improving someone else's property. To encourage payment, the contractor may offer to waive lien rights up to a certain date or dollar amount. Altogether, there are four separate lien waivers: partial conditional, partial unconditional, final conditional, and final unconditional. A conditional waiver offers more protection to the lien claimant, and depends on the payment clearing the bank, meaning that there are no bounced checks or other complications. An unconditional waiver offers more protection to the owner and is effective regardless of payment receipt. For example, let's say a customer makes a payment toward the total balance due and contractor offers to release a portion of the rights reserved by a recorded lien. After the payment clears the bank, the claimant completes and records a conditional waiver on progress payment form, which identifies the parties, the nature of improvement, the property, and the relevant dates and payments applied. This article is provided for informational purposes only and should not be relied upon as a substitute for the advice of an attorney. 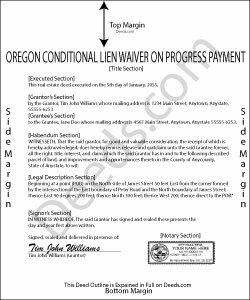 Please contact an Oregon lawyer with any questions about waivers or other issues related to construction liens. Reply from Staff: Thanks Larry, we appreciate your feedback. Eleody L. said: I mistakenly ordered the wrong package and within 3 minutes of asking for a replacement, I was given one by the company. I am extremely impressed with the prompt response and the forms! I will use this site again if I needed other deed forms!!!! Cathleen H. said: The pdf form is good; however, the input boxes merge into the line above so the text is hard to read when complete. I added a return before entering my data and this solved the problem. Reply from Staff: Thank you for your feedback Cathleen. We will have staff take a look at the document for issues with the text fields. Have a great day! Jane H. said: So far, so good! Reply from Staff: Thank you Jane. Have a great day!